This is Julep "Mandy". I have a few reds in my collection, but I don't wear them much at all. Now that I tried this, I feel like I might start wearing them more. Red is such a good look and I forgot how much I enjoy it. This is described as a pink-coral but I don't really see much pink. It's more of an orange-red to me, but so pretty and bright! Julep's formula is sooo nice. This was opaque in 1 coat, but I always apply 2 anyway. It was on the watery side, but I just had to put less on the brush and a little bit went a long way. This is such a pretty color! Your photo captures it as a mix of each color you mentioned-- red, coral, pink (okay, maybe I don't see the orange, lol). I love colors like this. this looks great on you! 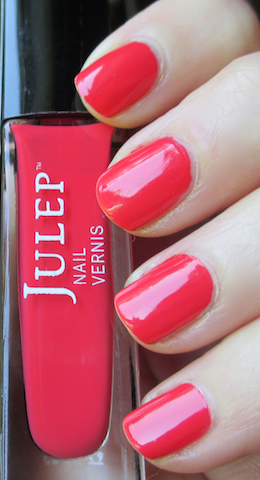 I am a big fan of Julep, there cremes have always looked great on me.